Ten table quiz questions relating to the RMS Titanic. On what date did Titanic depart Southamptn on its maiden voyage? What do the initals RMS represent? How many standard wooden Harland and Wolff lifeboats, with a capacity of 65 people each, did Titanic carry on her maiden voyage? 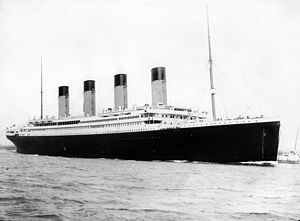 For Titanic, what was significant about 12:15 pm on 31 May 1911? Captain Edward John Smith was transferred from which ship to take command of Titanic? What was the full name of the Jesuit trainee priest who was a keen photographer and took many photographs aboard Titanic? How many of Titanic's 6 first class children passengers survived the sinking? White Star Line chartered which cable ship from Halifax, Nova Scotia to retrieve bodies after the sinking? 1955 saw the publication of Walter Lord's influential non-fiction book which weaved numerous personal accounts from survivors. What the book's title? On what date in 1985 was Titanic discovered on the seabed by a Franco-American expedition?